Text and photos by Kimberly Cecchini-originally posted on The Capital Press. Plastic bags are like leaves; rustling on the ground, adorning tree branches and floating through air and water. In fact, plastic bags float so far from our hands that many have accumulated into a ‘Giant Vortex’ in the Pacific Ocean. Commonly referred to as the ‘Great Plastic Garbage Patch’ – only fun for its throwback to Charlie Brown, but not adequate in its description- the colorful swirl is estimated to be twice the size of Texas. Following plastic bag bans in other cities in the United States, New York City is again looking for ways to contend with its own 10,000 tons a year issue that costs $10 million dollars to dump. Yes, it annually costs the Big Apple $10,000,000 to dispose of all those smiley faced bags. That’s gotta be enough for a couple of happy hour rounds to put smiles on the entire metropolis- or for a few other things on New Yorkers’ wish list. The proposal will not make people completely bemoan the loss of the oily totes; they will be able to acquire each one for a 10¢ fee. The hope is that folks will be more inclined to carry a reusable bag-there are some that even roll-up to pocket size- or at least manage to carry a single banana or ironically, a single water bottle, without the reflexive bag grab. 70 American cities, including Washington, D.C., have already banned one-use bags. Early last year, the District Department of Environment with the Alice Ferguson Foundation surveyed capital residents and businesses after 3 years of a ban similar to the New York proposal. The results are quite stunning: 67% see fewer plastic bags as litter, 80% report using less disposable bags, 80% carry reusable bags when they shop and 53% support the law while only 16% are ‘bothered’ by it. 69% of businesses responded that the law has either been positive (21%), has no impact (48%) or has had a mixed impact (8%) on their functioning. Before plastic, the paper bag reigned. Once their younger, plastic cousins were found to be cheaper, retailers began embracing them. Since the mid-1970’s, they have become than the norm; within 20 years, 8 out of 10 bags were plastic. Although I arrived too late in the seventies to recall the bag transition, I have observed enough cultural changes to understand that most things are resisted at some point until they saturate our experiences. Can you remember a time when we found our way home before GPS? I stubbornly stuck to maps for awhile and, alas, now I am only bothered with turn-by-turn directions when they interrupt my Bluetooth. Not for nothing, it’s not that long ago in the United States that we were fortunate enough to safely hydrate without a ready bottle of Poland Springs. People get used to things. If the ban passes, most New Yorkers-like their D.C. brethren-will get used to carrying their own bag. Eventually sticking a reusable tote in our pockets will be as mindless as grabbing and tossing a plastic one. Like they once were before the advent of disposable bags, reusable bags will just be…bags. “A Brief History of Plastic & Paper Bags.” Hands On Hemp. N.p., n.d. Web. 22 July 2014. “An Ocean of Plastic.” PBS. PBS, 09 Aug. 2010. Web. 22 July 2014. “De Blasio at Six Months: The Administration’s Take.” The Brian Lehrer Show. WNYC. New York, New York, 18 July 2014. Radio. Schmitt, Carrie. “Plastic Bag Bans.” The Municipal. N.p., 12 June 2012. Web. 22 July 2014. 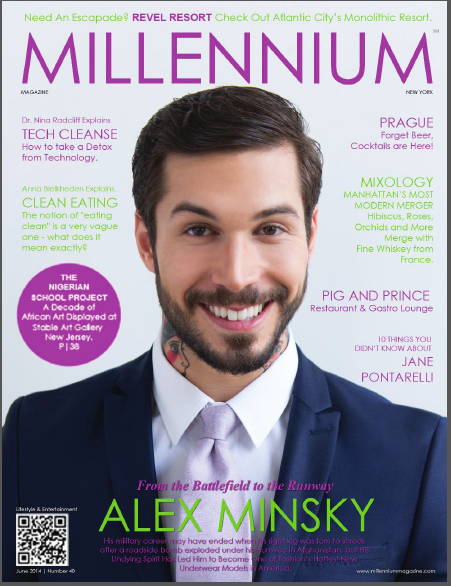 As featured on the cover of Millennium Magazine, June 2014. “Not many chefs look their food in the eyes. Literally…I know my lambs. I’ve birthed lambs…I witnessed the birth of this lamb and now I’m going to witness the reason for its existence,” Chef Michael Carrino earnestly speaks about the relationship he has with some of the humanely raised animals that he chooses for Pig & Prince, his second restaurant in Montclair, NJ. Chef Carrino developed his predilection for fresh, local food through the ethics of his alma matter, the famed Culinary Institute of America. He attended the New York campus where he says that a significant amount of ingredients were sourced from farmers in the surrounding Hudson Valley. Now he proudly supports farmers in and around New Jersey and has trusted the same fish monger every day for the past seven years. His passion is unmistakeable for what, he says, “our grandparents simply called food”. Inspiration for the dishes is just as local as many of the ingredients; Pig & Prince is “Jersey” food. The menu aptly represents the meaning behind the gastropub’s name; the food may be more casual than the expensive French cuisine he served at his previous venture, but there’s little else that is casual about the Jersey inspired food. There is an elegance behind the creation and presentation of the dishes. Each plate is a carefully executed lithograph of the Garden State native’s works of art. Sitting in what used to be the epicenter of town, the Montclair Railroad Station of Lackawanna certainly deserves its acknowledgement as a notable architectural treasure on the National Register of Historic Places. 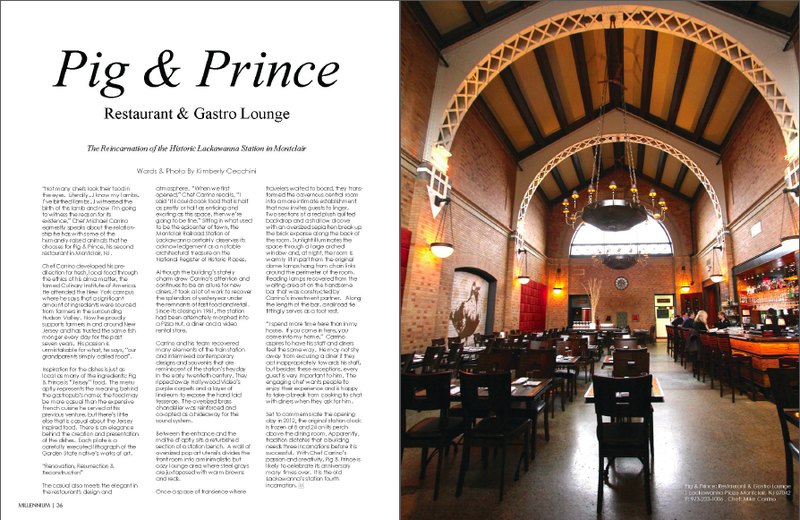 Although the building’s stately charm drew Carrino’s attention and continues to be an allure for new diners, it took a lot of work to recover the splendors of yesteryear under the remnants of fast food and retail. Since its closing in 1981, the station had been alternately morphed into a Pizza Hut, a diner and a video rental store. Carrino and his team recovered many elements of the train station and intermixed contemporary designs and souvenirs that are reminiscent of the station’s heyday in the early twentieth century. They ripped away Hollywood Video’s purple carpets and a layer of linoleum to expose the hand laid tesserae. The oversized brass chandelier was reinforced and co-opted as a hideaway for the sound system. Between the entrance and the maître d’ aptly sits a refurbished section of a station bench. A wall of oversized pop art utensils divides the front room into a minimalistic but cozy lounge area where steel grays are juxtaposed with warm browns and reds. 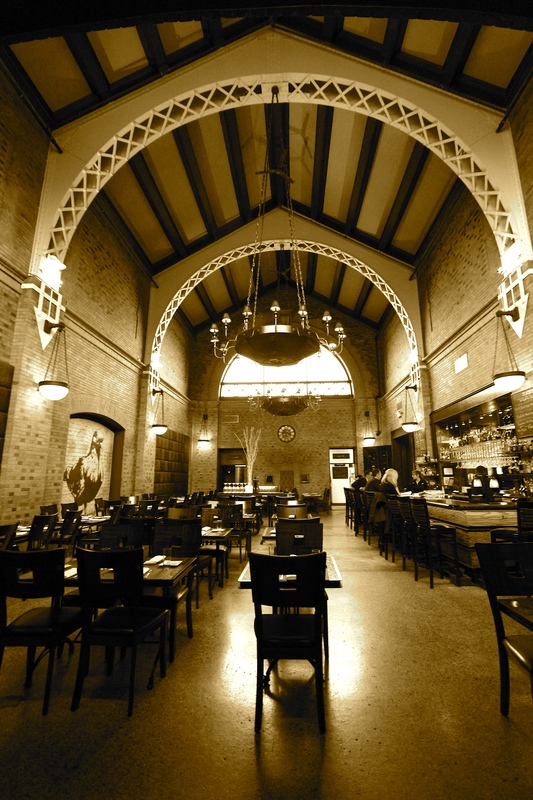 Once a space of transience where travelers waited to board, they transformed the cavernous central room into a more intimate establishment that now invites guests to linger. Two sections of a red plush quilted backdrop and a shallow alcove with an oversized sepia hen break up the the brick expanse along the back of the room. Sunlight illuminates the space through a large arched window and, at night, the room is warmly lit in part from the original dome lamps hang from chain links around the perimeter of the room. Reading lamps recovered from the waiting area sit on the handsome bar that was constructed by Carrino’s investment partner. Along the length of the bar, a railroad tie fittingly serves as a foot rest. “I spend more time here than in my house. If you come in here, you come into my home.” Carrino aspires to have his staff and diners feel the same way. He may not shy away from excusing a diner if they act inappropriately towards his staff, but besides these exceptions, every guest is very important to him. The engaging chef wants people to enjoy their experience and is happy to take a break from cooking to chat with diners if they ask for him. 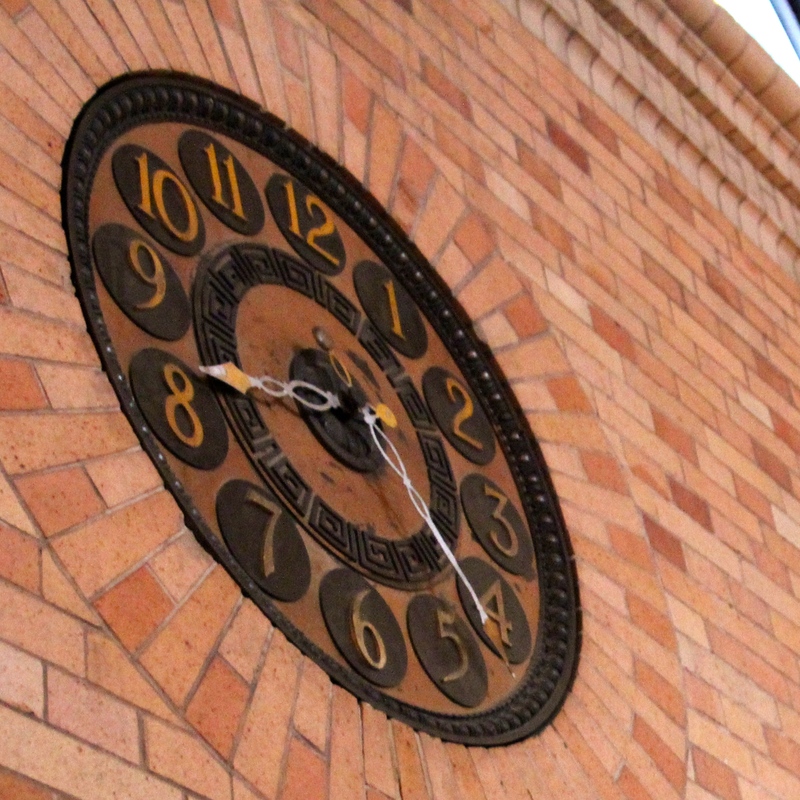 Set to commemorate the opening day in 2012, the original station clock is frozen at 8 and 24 on its perch above the dining room. Apparently, tradition dictates that a building needs three incarnations before it is successful. 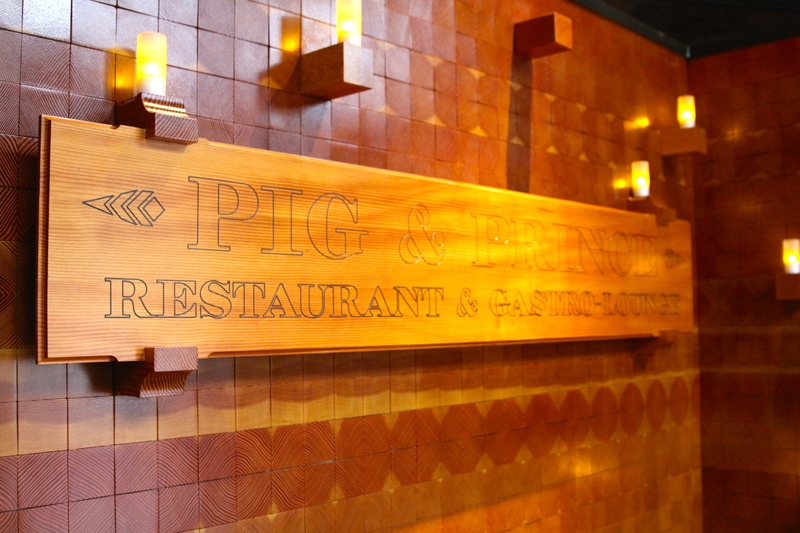 With Chef Carrino’s passion and creativity, Pig & Prince is likely to celebrate its anniversary many times over. It is the old Lackawanna’s station fourth incarnation. “We’ve all proven that we can’t be trusted with the future tense. We’ve all been asked, don’t you want to leave a better Earth for your grandchildren and we all have collectively responded,” John Oliver punctuates our collective insolence with a shrug, “eh, f— ’em”. Human nature is shortsighted; many of our actions and even governmental policies are band-aids for the present at the peril of the future. We can just look at the makings of the Great Recession for examples. Companies collapsed at the behest of insatiable greed and individuals garnered insoluble debts to live out of reach lifestyles. Forget the grandchildren, sometimes I don’t think we can be trusted with next week. Although people are still trying to contest climate change, it seems that lately there has been the greatest shift to reframe the conversation since the rebranding of “global warming” to “climate change”. There appears to be some trends away from a focus on polar bears to affects on more tangible issues such as health. On the second of June, the United States Environmental Protection Agency (EPA) announced the Clean Power Plan, a proposal that aims to reduce carbon pollution from our power plants. The EPA claims that the initiative will reduce associated health issues. It projects that this plan will, over the next 15 years, reduce harmful carbon emissions from the plants by 30% below the 2005 numbers and reduce particle pollution, nitrogen oxides, and sulfur dioxide by 25%. In a radio broadcast from a children’s hospital in Washington, D.C. where he visited kids with respiratory problems, President Obama drew a solid line between public health concerns and climate change, “Often these illnesses are aggravated by air pollution—pollution from the same sources that release carbon and contribute to climate change”. If folks cannot feel the ropes we are tying around our hands in the future tense, perhaps they can take note of the bronchial tubes that are tightening in the present tense. So, what can we do NOW? Please tell us below. “Ep. 3: Climate Change Debate.” Last Week Tonight. HBO. 11 May 2014. Television. “EPA Proposes First Guidelines to Cut Carbon Pollution from Existing Power Plants/Clean Power Plan Is Flexible Proposal to Ensure a Healthier Environment, Spur Innovation and Strengthen the Economy.” EPA.gov. N.p., 02 June 2014. Web. 15 June 2014. “The Public Health Consequences of Air Pollution.” Takeaway. N.p., n.d. Web. 15 June 2014. Thurston, George. “STATEMENT OF DR. GEORGE D. THURSTON, Sc. D. TO THE COMMITTEE ON ENVIRONMENT AND PUBLIC WORKS OF THE UNITED STATES SENATE RE: THE HUMAN HEALTH EFFECTS OF AIR POLLUTION FROM UTILITY POWER PLANTS.” (n.d.): n. pag. Epw.senate.gov. Web. 15 June 2014. I was walking along with my friend and I saw a heart-wrenching incident on our way. As we walked by a temple there were quite a few beggars outside the temple. The beggars comprised of an old senile lady, some kids and a few men. Now, the lady was wearing a saree in the clumsiest way possible, her blouse didn’t fit her at all and gave a generous sight of her sagging breasts, her hair was all messed up, her face was dirty like she hasn’t washed it for years and from her actions one could easily make out that she was completely insane. A guy came with 8-9 packets of Parle-G and all the beggars started fighting for their share of Parle-G, and it was an ugly sight because they fought like animals maybe worse. The worst part was that they fought for “Food”, something that most of us take for granted; in fact many of us don’t give a second thought while wasting or throwing away food. We are so ignorant and busy with our little problems that we fail to see the bigger picture. We do not understand that a large chunk of the population in this world dies because of paucity of food and water. These are the things that we take for granted and hence waste it. Ours is a generation that has not been taught to conserve be it the little things like an eraser, a pencil, a pen, a paper or the bigger things like water, food, trees, air and so on. We have got it all from childhood so conservation is a term that is absent from our dictionaries. Why conserve? 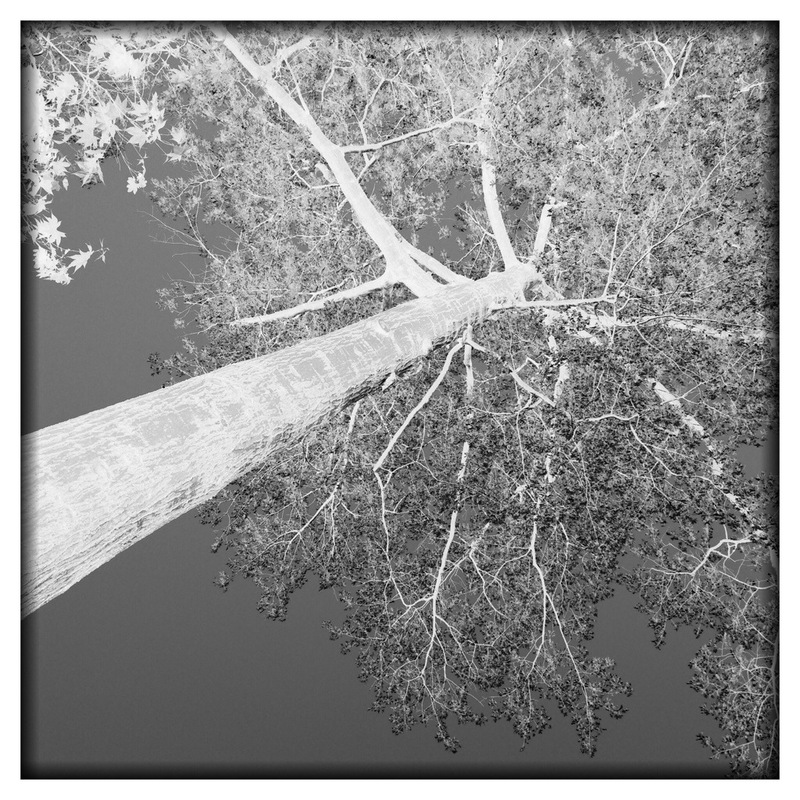 Conservation for many of us is analogous to frugality. When you have money you don’t want to be frugal. I remember in my mother’s generation people were much more considerate she used to tell me that her father would never get her a new eraser until and unless she has used up and finished her earlier eraser, and the reason isn’t that he didn’t have money but because he valued resources. When you entrench such values since childhood only then, can the child learn to implement them in other arenas of his/her life. My mother has never given me anything in abundance and that is how I learnt the real value of resources. Everything is precious no matter how small or big it might be. Wastage has become a trend and people consider it cool to waste things. I mean when I see the way people waste water just because it is cheaper than other things it just depicts their short sightedness. These people are creating a difficult world for their future generations. Their kids might not enjoy the similar things that they have, and their grandsons and granddaughters might find it even harder to stay in a world with lesser water, lesser food and more pollution. Nowadays, if people value something it is when that something has a price tag on it and is sold at exorbitant prices. Until and unless that happens people do not consider resources precious. Now that petrol prices have soared, the usefulness, the judiciousness and the scarcity of it has struck people but earlier it was wasted as well. The Delhi government reduced the price of water, and I consider it a foolish and juvenile decision because this will promote the wastage of water which is so rampant in middle class homes in Delhi. I agree that water should be made available to everyone irrespective of their financial status but this step is not very well thought out step. In fact there should be a policy according to which the household with the minimal usage of water with respect to the number of family members should get you some price/gift or some honour from the Delhi Chief Minister. Excess of usage should enable you to pay higher water bills. Like tax slabs there should be slabs on water usage as well (consider the number of family members). This can prevent the wastage and will ensure judicious use of water. As far as food is considered in a utopian world it is the responsibility of the government to feed every citizen but since we live in a real world we can’t expect that to happen. All of us should make a promise to ourselves, whenever we eat at a high-end restaurant t or whenever we eat out, we should feed one hungry person. It requires barely 10% of what you spend on yourself. If you spend 100, then just spend 10 or 15 rupees and feed a hungry person. The idea of keeping a fast is there in religion to instil a sense of empathy for the hungry, to feel what they feel for a day. So, if you can feed the hungry it is much better than, just feeling their pain. Wastage of food is just not an option until and unless it has got rotten. We can always feed the animals. If each one of us agrees on feeding 1 person whenever we go out, and not to waste food then this world will be a better place even for our future generations. Views presented in the article are those of the author and may not be of Tonight at Dawn. 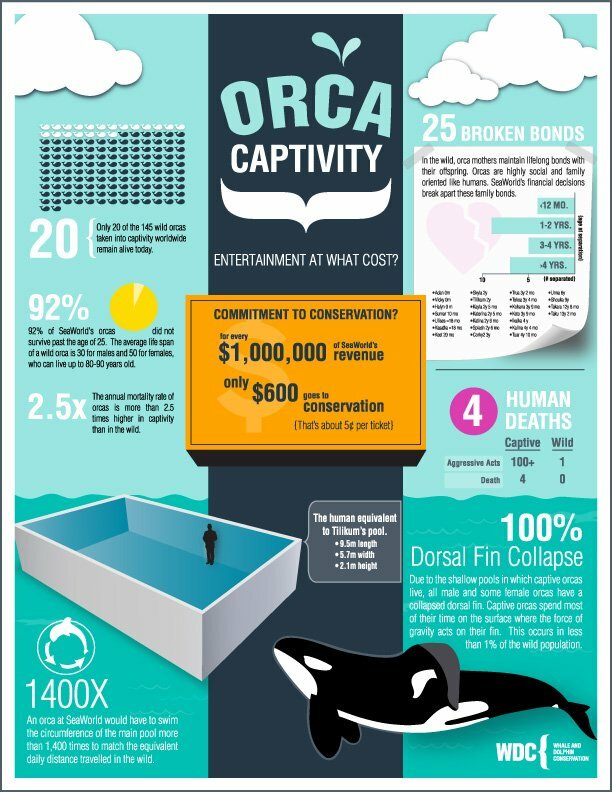 Life in a Bath Tub: Orca Entertainment at What Cost? “I wouldn’t be thriving if I was living in a bath tub,” Australian orca proponent Tony Moore retorted during our interview when I shared Sea World’s Vice President of Veterinary Service’s claim that its whales were thriving in the park. Moore, a marketing manager in the health care industry, has recently turned his attention back to his passion for animals by initiating a proposal for the care of the orcas that may be mandated for release from Sea World. He has practical experience built upon his passion; Moore holds a degree in Zoology and has worked on projects for the New Zealand Ministry of Fisheries. Focusing his energy on Cetaceans was instinctive as he has always had an affinity for the sea and these animals are particularly “…emotive to the public and incredibly intelligent.” Furthermore, Moore is alarmed by the significantly growing number of captive cetaceans in eastern Europe and Asia. Although Moore recognizes that there are numerous eager animal advocate groups, he sees that many lack the ability to build and implement successful plans. He hopes to use his own background and relationships with experts to develop a mutually viable plan in the service of the orcas that may be released. In order to engender an allure for the public, theme parks apparently have created a positive image of their practices to sustain ticket sales. According to Dr. Naomi Rose of the Animal Welfare Institute and the sponsor of the stalled California bill to ban captive orca breeding and whale shows, studies on orcas have been rosily colored by their marine park origins, “The history is that our science is built on the backs of people who got their start in the public display industry.” In a Sacramento Bee article, she directly states that orcas in captivity do not thrive like their wild kin. As some cetaceans sympathizers battle the economic powers of tourist destinations as Sea World, other sympathizers like Tony Moore are looking at the future of the orcas that they hope will touch the sea again. Tonight at Dawn looks forward to updates from California and from Moore and his co-activists. Cecchini, Kimberly. “Tony Moore, Advocate.” E-mail interview. 8 May 2014. Gorman, James. “Smart, Social and Erratic in Captivity.” The New York Times. The New York Times, 29 July 2013. Web. 25 May 2014. Hicker, Rolf. 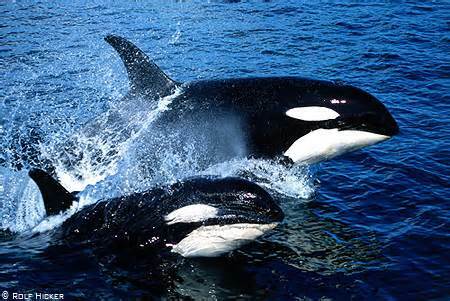 “Orcas (Killer Whales), Orcinus Orca.” MarineBio.org. N.p., n.d. Web. 25 May 2014. Mooney, Jerye. “Captive Cetaceans: A Handbook for Campaigners.” (n.d.): n. pag. Whale and Dolphin Conservation (WDC). WDC, 1 Jan. 1998. Web. 25 May 2014. White, Jeremy B. “Bill to Ban California SeaWorld Orca Shows Sidetracked.” The Sacramento Bee. The Sacramento Bee, 8 Apr. 2014. Web. 25 May 2014.